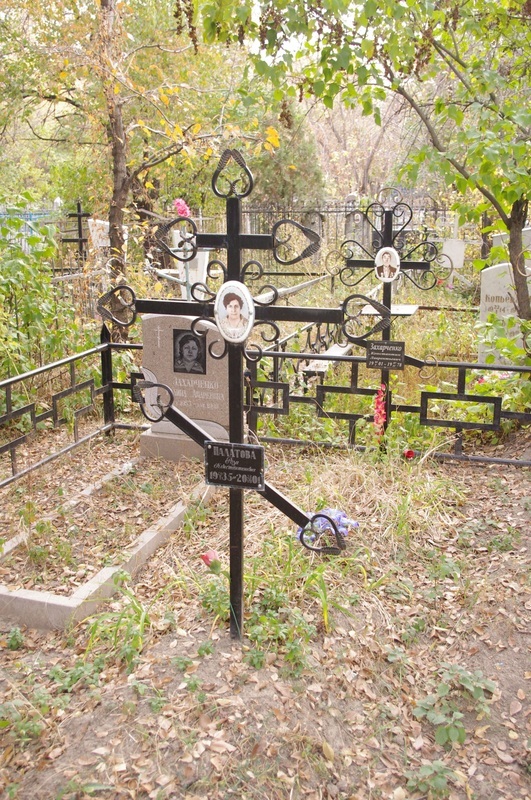 Cemeteries in Almaty are not the well-trimmed lawns you find back in the States, with tidy crosses and headstones. They're overgrown with weeds and covered with dead branches, and the graves are either sadly cheap or grandiose. 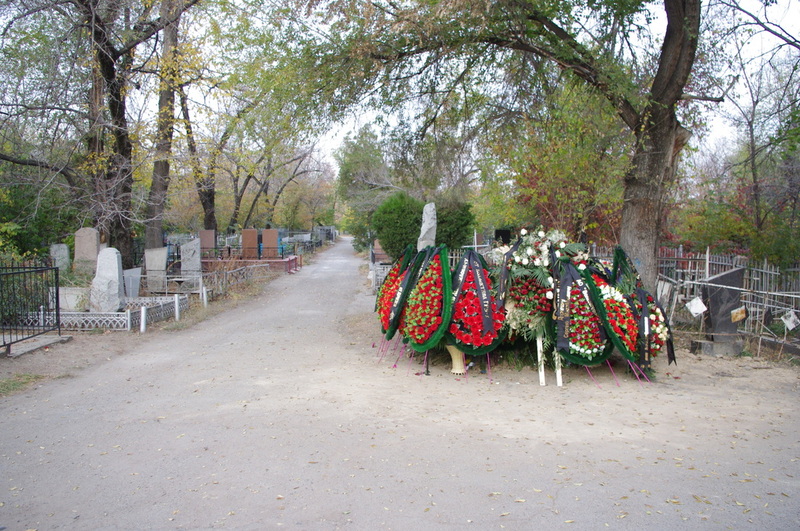 People here bring flowers to their loved ones, of course, but it's just as common to bring big tear-shaped wreaths, sold at the entrance gate. 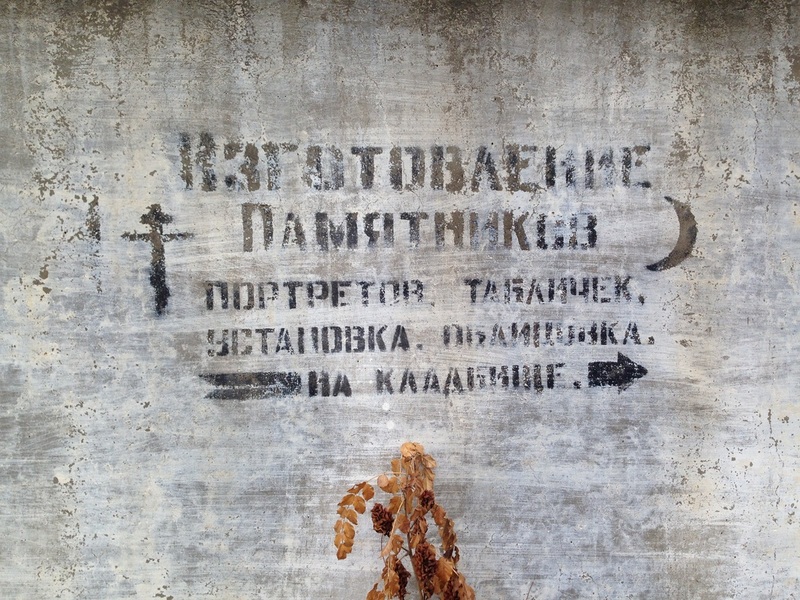 I find these places fascinating to explore and peaceful to stroll, but I can understand why some might be uncomfortable with the idea of documenting a site loaded with such emotion. 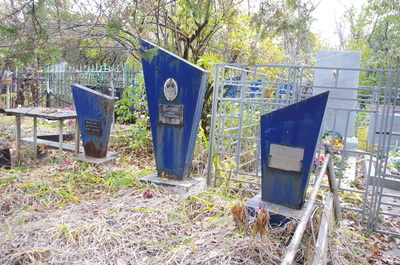 I hope I can treat this topic without any disrespect. 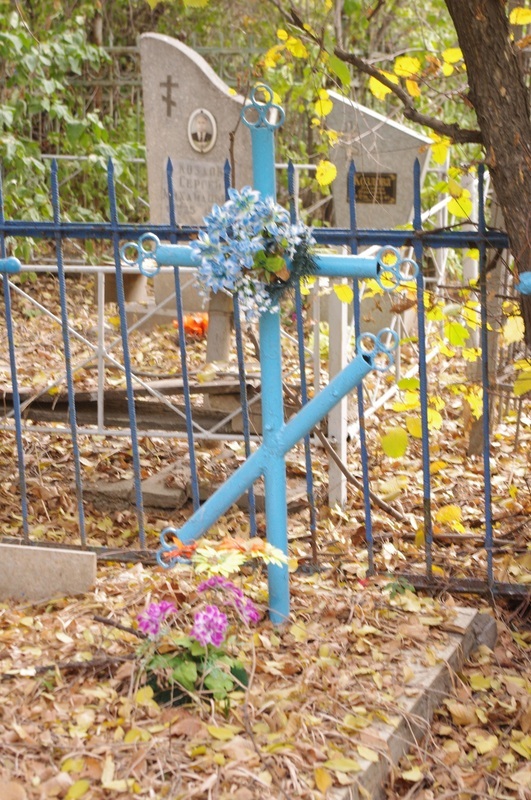 Most funeral plots are fenced off with ograzhdeniye, creating a demarcated space that feels very personal. 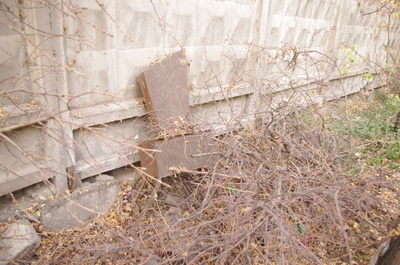 There is often a metal table and a bench. 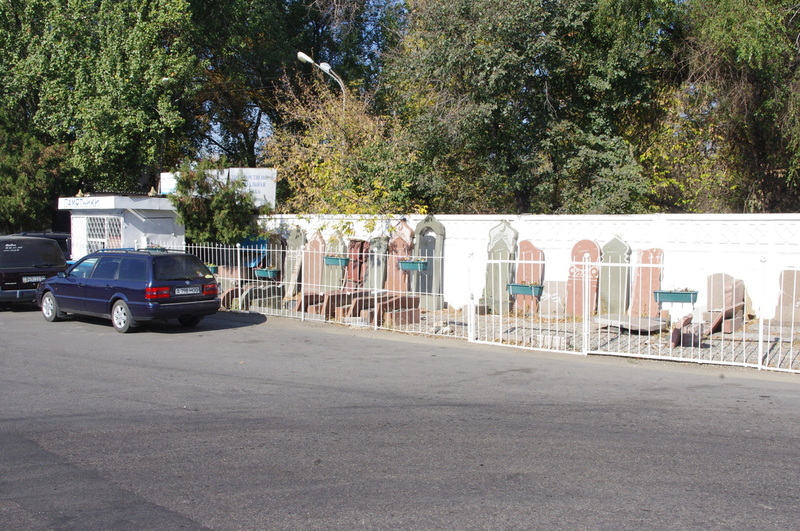 The effect is eerie, the cemetery a complex of open-air sitting rooms for mourning. The low iron fences are all pressed close, with the narrowest of paths in between them, so that when you head off the main road you end up in a maze, complete with dead ends and inconvenient detours. If you can call a cemetery a necropolis, a city of the dead, then an Almaty cemetery is not a planned town with a neat grid, but a old world village with winding alleys that hold secrets. 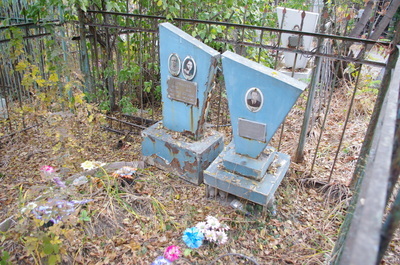 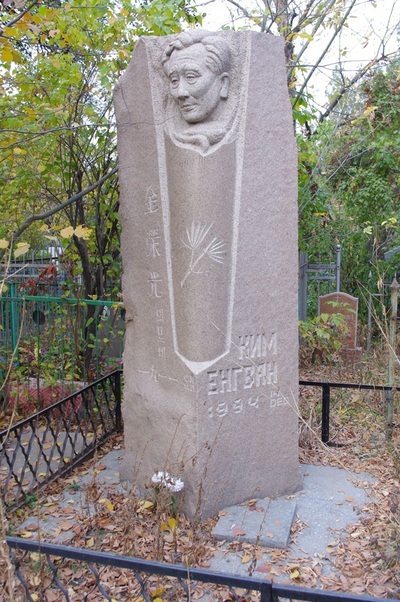 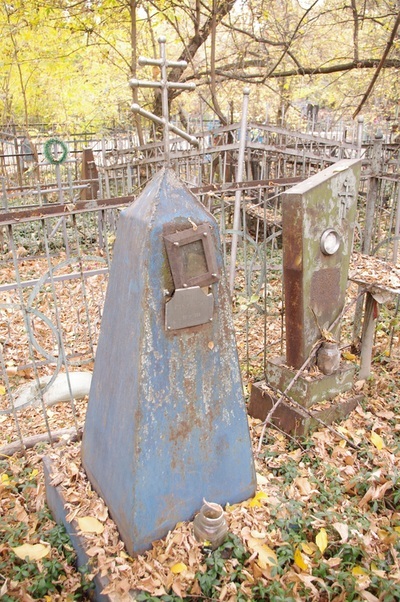 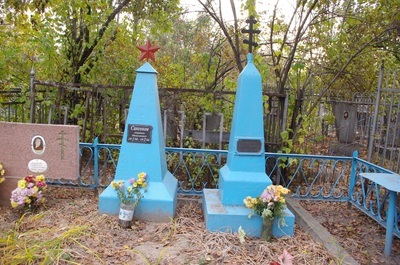 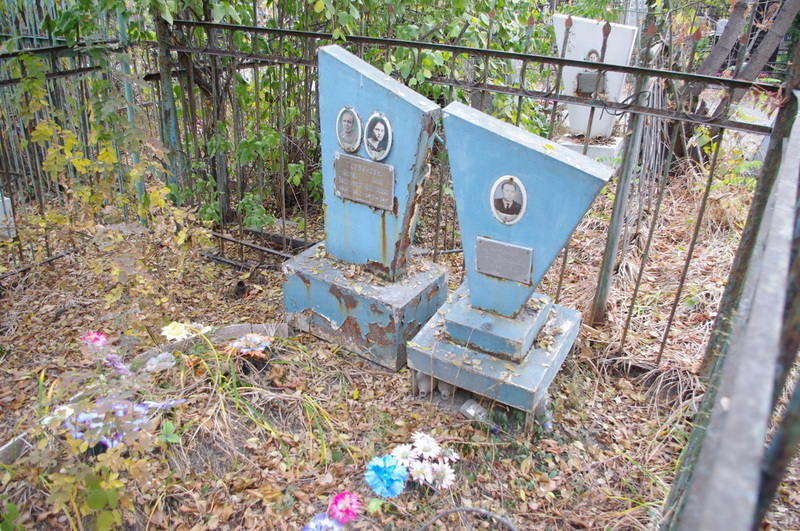 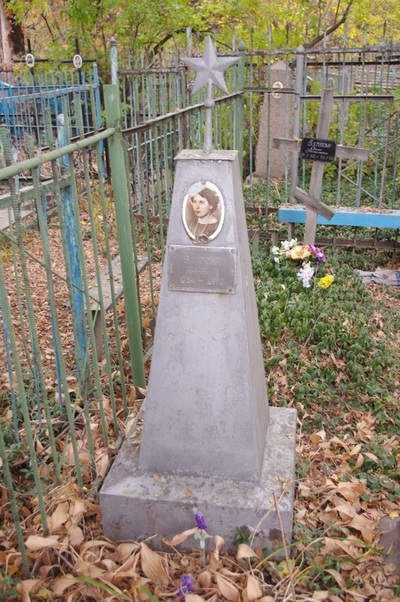 The most common grave marker is an aluminum obelisk, sold in the Soviet years to families without means. 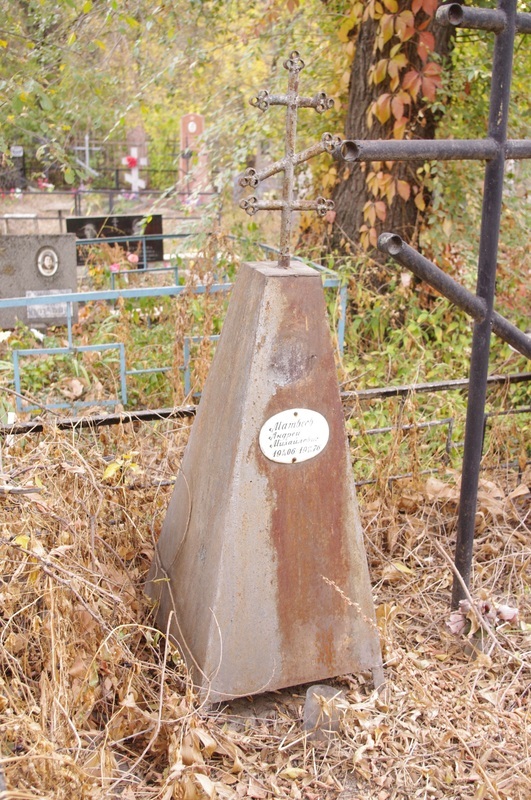 Also common is a trapezoid that's shaped, perhaps, like a minimalist take on a flickering flame. 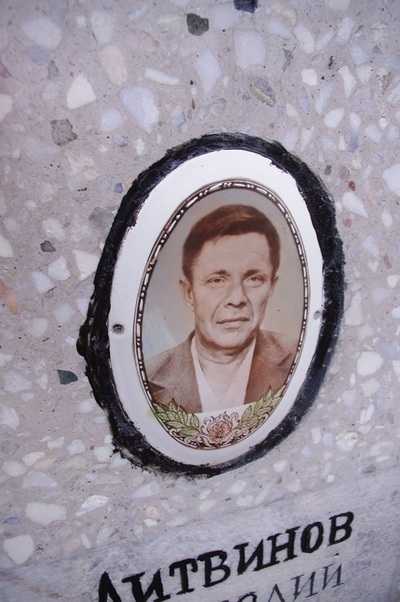 Screwed into the metal might be a plaque with an epitaph, or very often an oval photographic portrait, uncannily colorized. 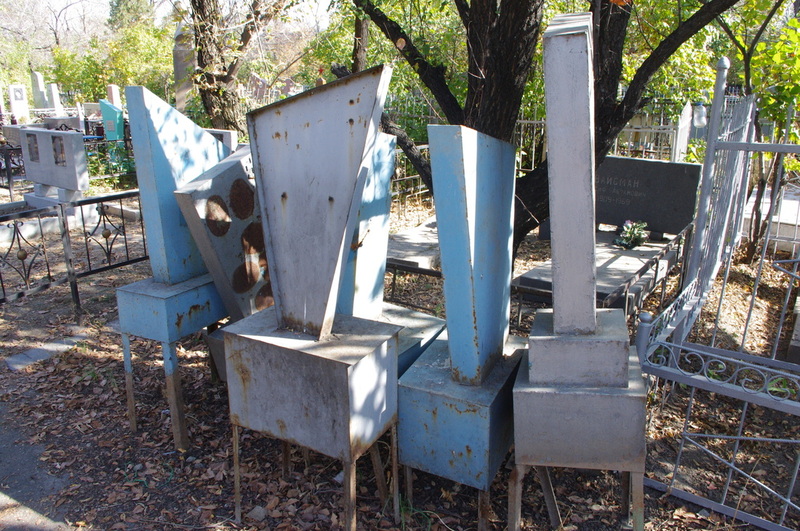 A grave should be meant to last, to keep a man's memory alive, but sadly these sheet metal monuments are usually in a poor state, warped or rusty or otherwise undignified. 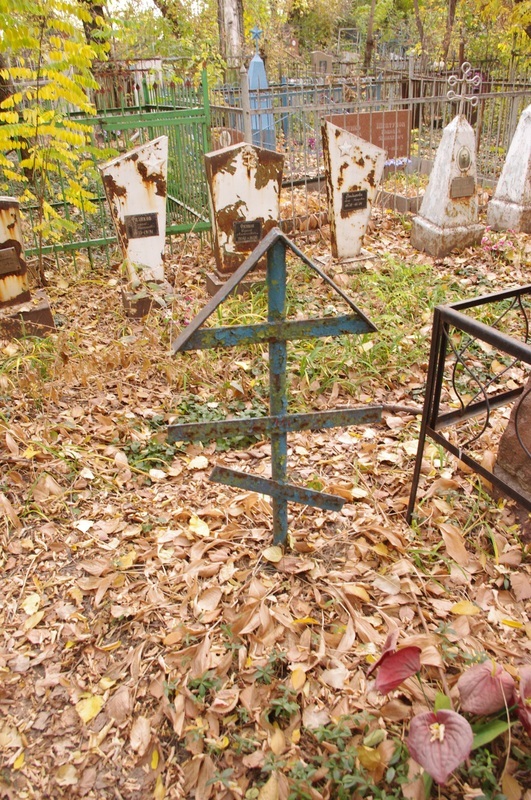 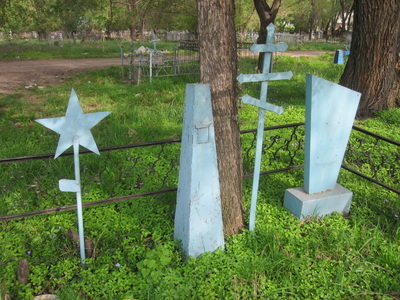 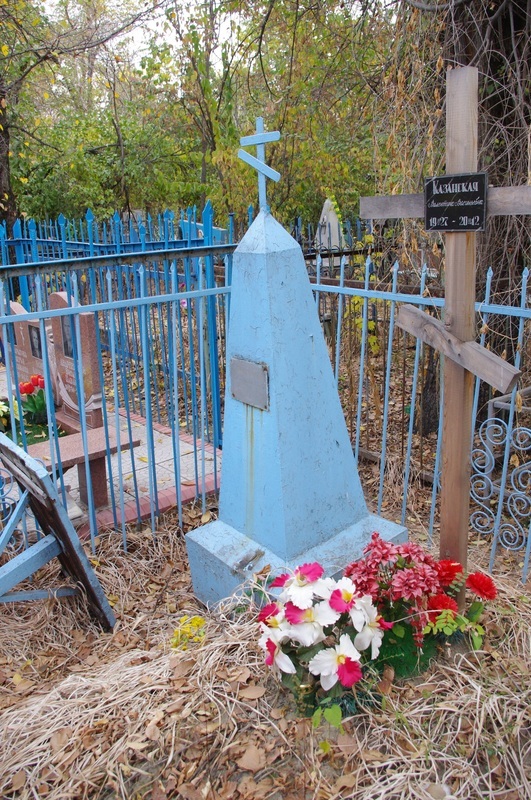 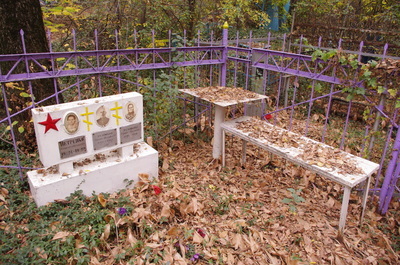 In a cemetery with Christian burials at least (and the cemeteries in Almaty tend to be mixed), the other most common grave marker is the Orthodox cross. Unlike the cross of Western Christianity, the Eastern cross has three crossbeams, the top one representing a plaque and the bottom a footrest. 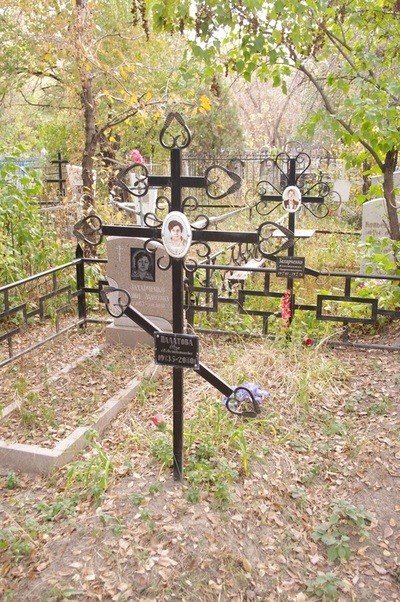 Though I had seen the the Russian cross before, I was interested to find that the cemetery crosses were usually embellished with three circles on the end of each beam. 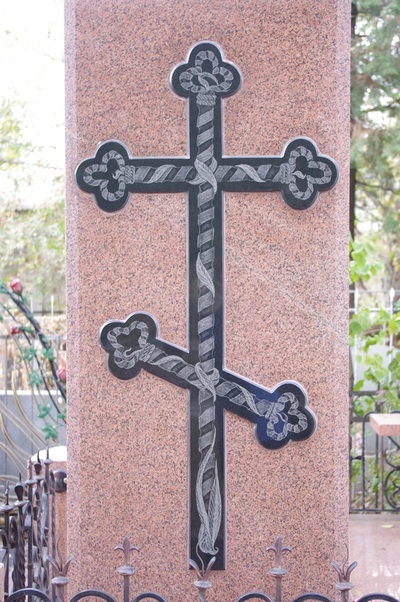 This kind of cross, it turns out, is called a trisostavny krest [трисоставный крест] and the shamrocks represent the holy trinity. 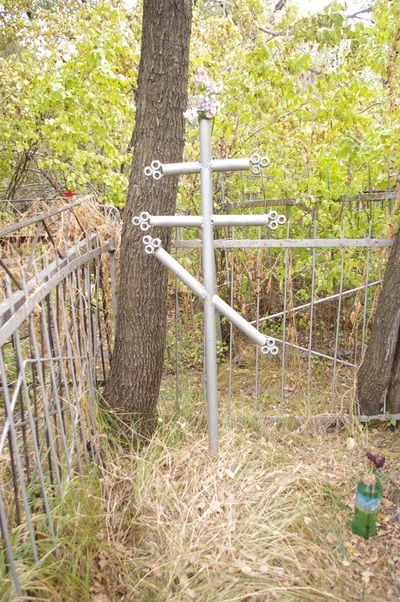 The style is similar to something called a Budded Cross in the West, closely associated with Celtic symbolism. In their cheapest form, these crosses are welded from metal piping, looking desperate and homemade. 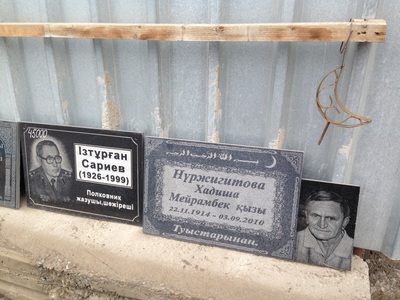 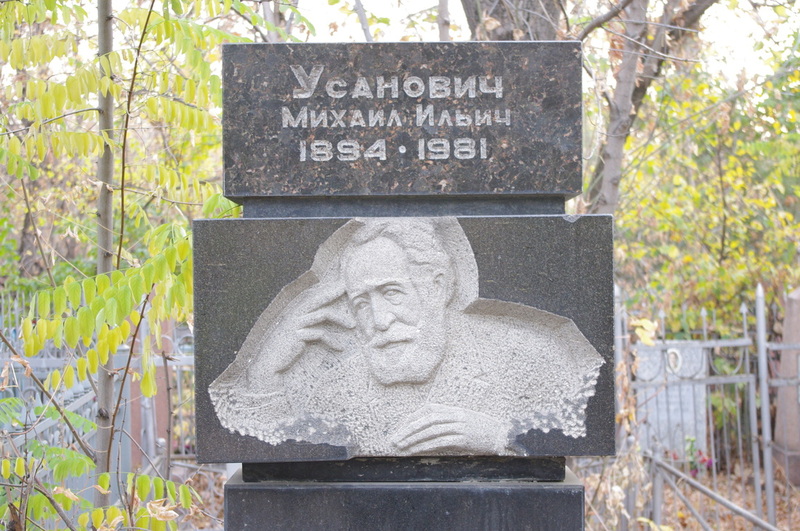 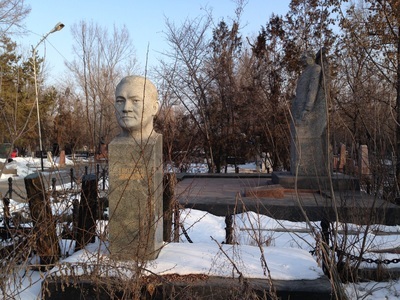 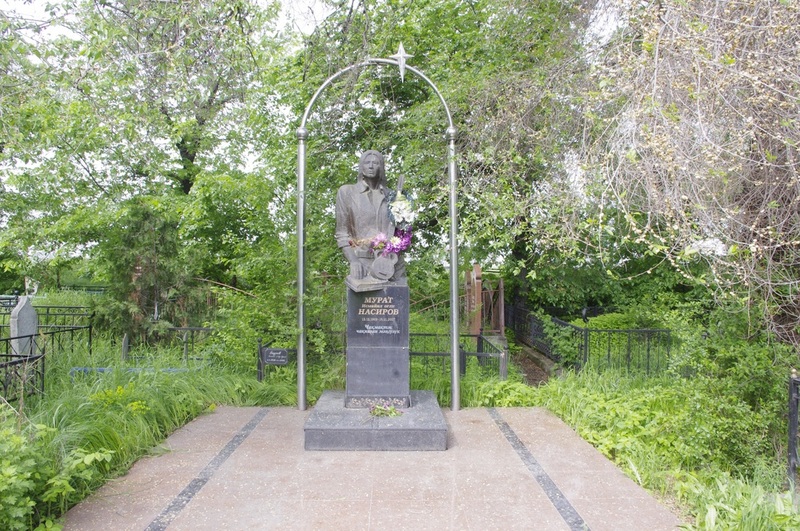 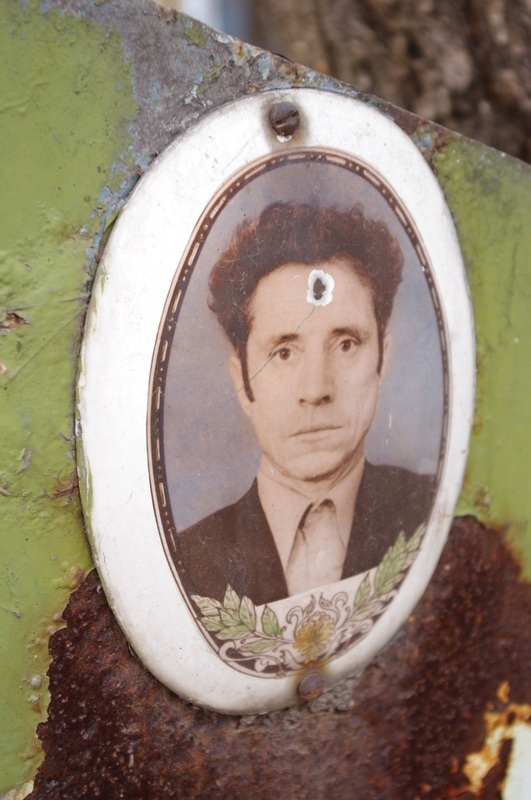 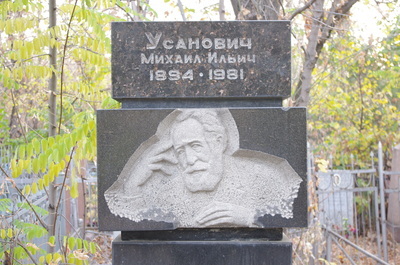 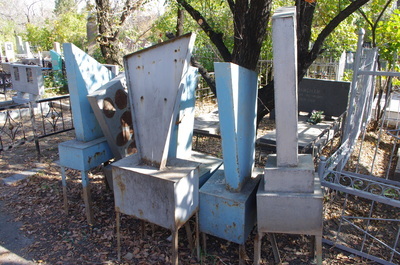 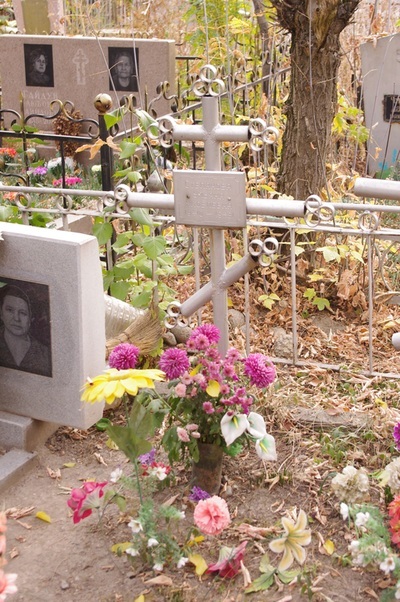 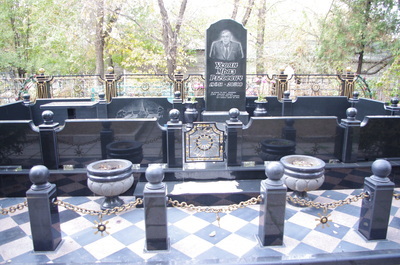 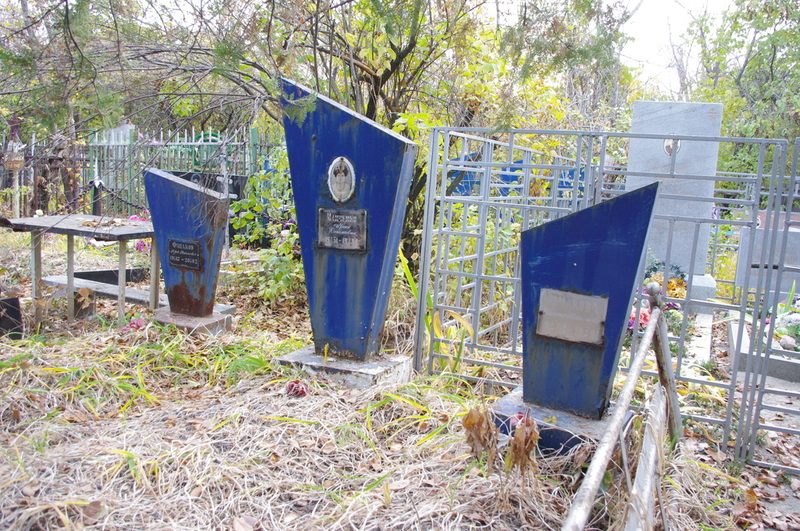 Though Almaty's cemeteries are populated most by these metal monuments to the common man, their biggest draw is as a kind of sculptural garden, because the rich and famous have left themselves graves of carved stone that shock with their immodesty. 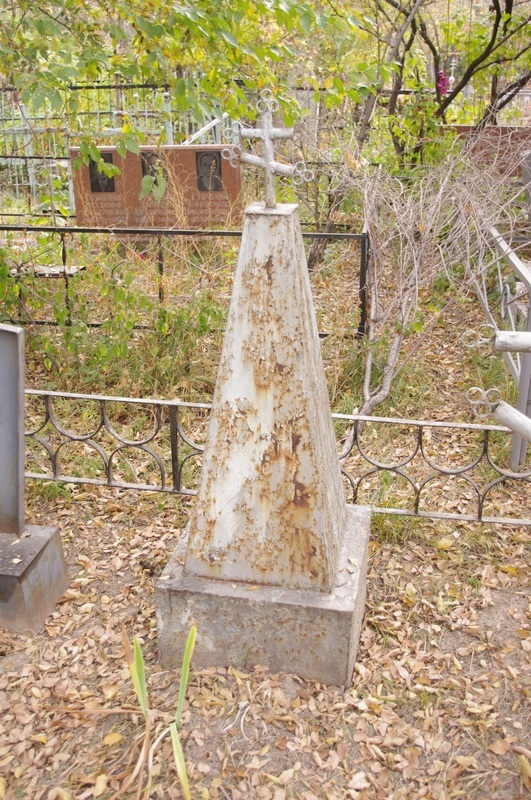 A civil engineer is carved with a highway backdrop, an academic with his hand to his temple in thought. 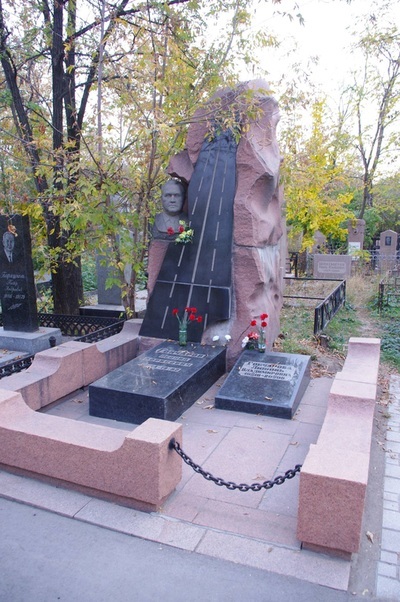 Illustrious members of the Soviet brass get their own full-body statues, while modern titans prefer to laser-etch their likenesses into black marble. 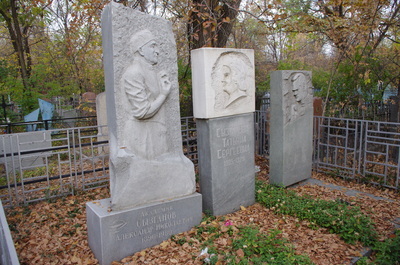 The artistic skill involved in all this impressive, and though it is hidden away in a emotionally-fraught ghetto, it deserves to be recognized. 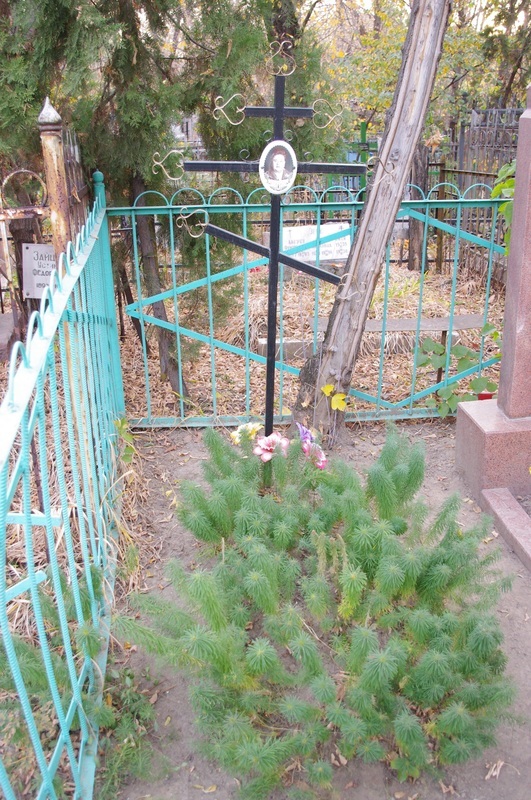 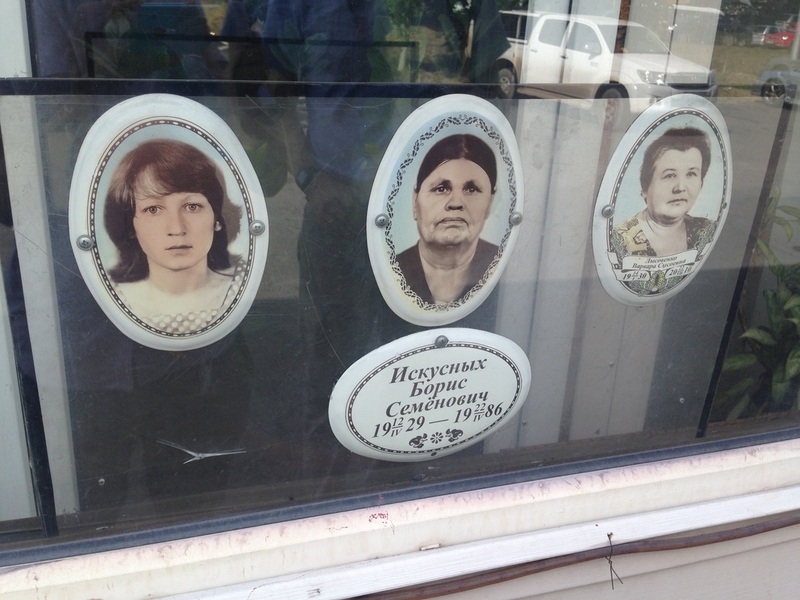 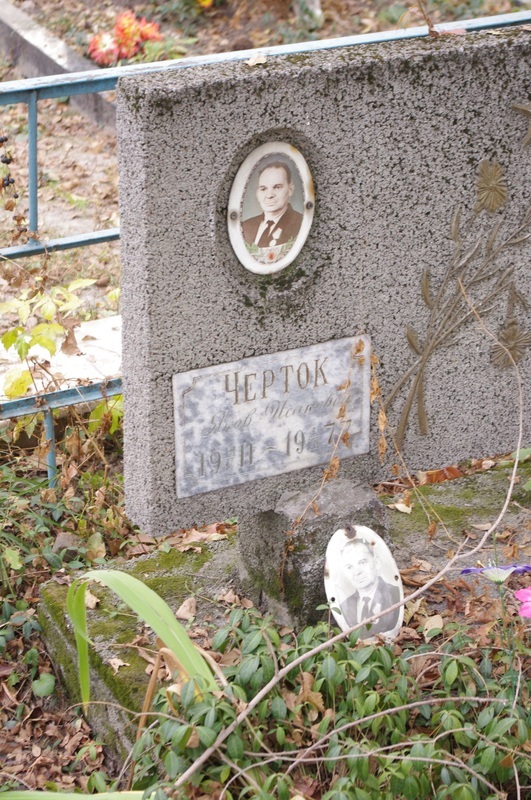 The last curiosity of the Almaty cemetery that should get a mention is the funeral wreath, or pokhoronny venok [похоронный венок]. 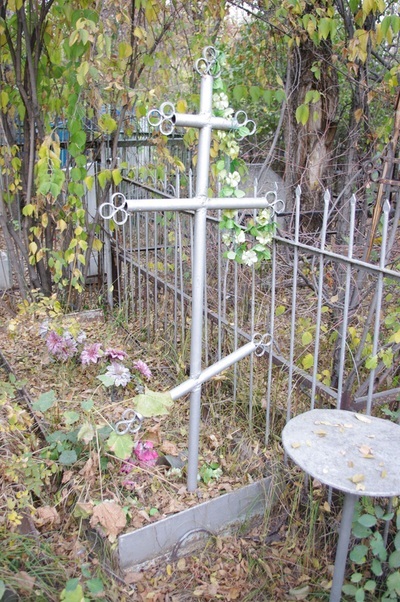 Here is another art that is unfortunately "tainted" by its affiliation with death. There are florists who specialize in making these beautiful arangements of laurel leaves and pine needles and baby's breath, and they should be well-versed in the symbolic language of flowers: red roses mark martyrdom, while violets and lilies show moral purity; periwinkle and ivy stand for everlasting life. Most unusual to me was the shape of the wreaths. 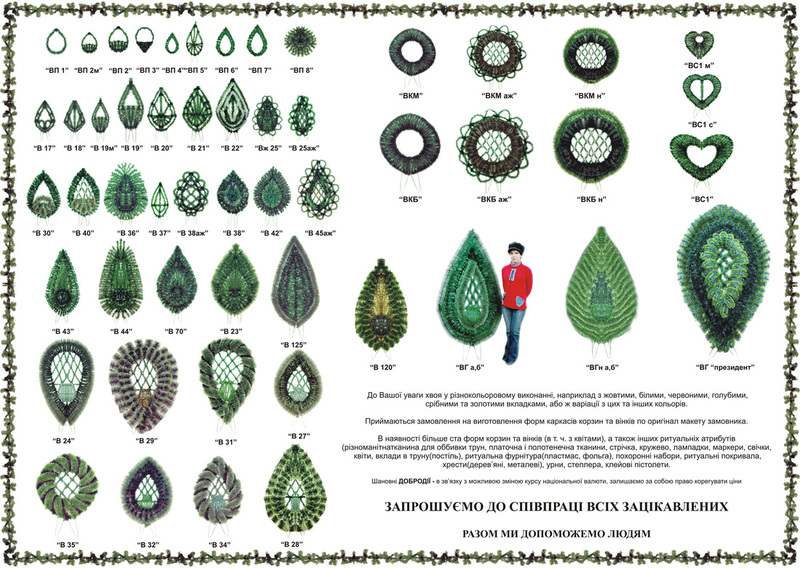 Christmas wreaths and bridal wreaths and so on are usually circular, a clear symbol of eternity, but Russian funeral wreaths tend to be shaped like a seed; in Russian the shape is called kaplya [капля], or "teardrop." 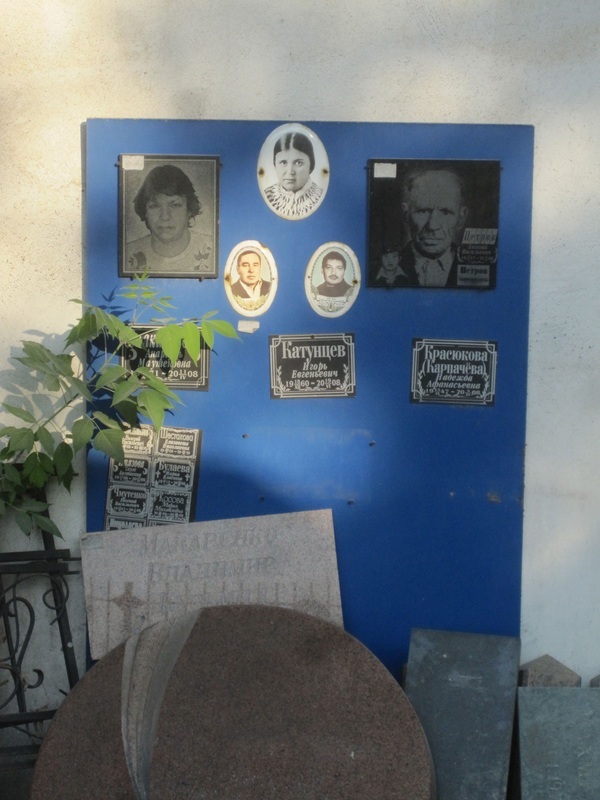 Some hypothesize that the shape represents something called a mandorla, a kind of aura shown to surround holy figures in Orthodox iconography. 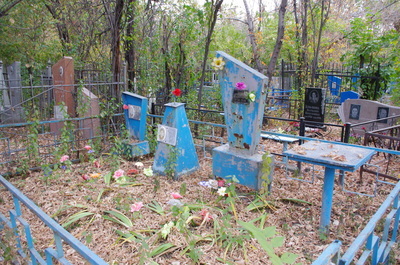 These floral auras are put on stands and left at grave sites, and because they're often made of artificial flowers nowadays, they can last for several seasons.